Obento with Tuna Fish for Two, Please! There’s something archaic sounding about tuna fish. When I was a kid, I remember that’s what it was called. Now, we just call it tuna. I don’t know when the fish part dropped—surely they’re still fish? But it seems that it outgrew the need to be labeled such. Language evolves, yes, and little Tuna Fish seems to have been affected—whether for better or worse, I don’t think it matters, does it? 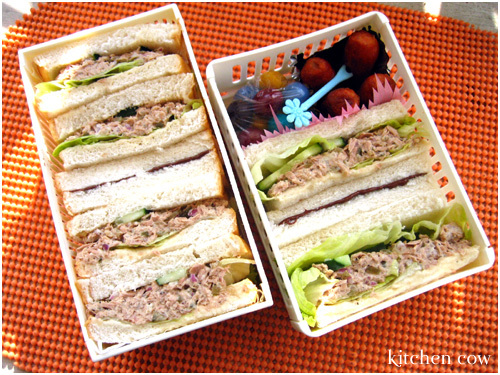 Another quick and lazy bento, these tuna salad sandwiches are a cinch to put together. I simply drained a can of tuna, chopped some onions, added pickle relish, sprinkling of salt and pepper, and just enough mayonnaise to glue it all together. Normally, I add chopped celery as well, but we were all out. For added crunch factor, I added some crisp iceberg lettuce and a couple of cucumber slices when I was assembling the sandwich. On a side note, I used half an onion that was in the fridge from something I cooked the day before. I minced it finely, with no tears! I guess Leki’s refrigerated half an onion tip really works! I know that’s a lot of sandwiches in the pictures, but that’s actually for two people. The one on the left is my mom’s and the one on the right is mine. For my bento, I added a couple of Hungarian sausages from Santis deli. These are by far the best Hungarian sausages you can buy locally that’s still reasonably priced. I’ve tried a lot of brands, from other delis even, but Santis is the best for me. To sweeten everything up, I split a Nutella sandwich between the two boxes and added some Mega Peanut M&Ms to mine. Not a big Peanut M&M fan but hey, it was in the fridge. So there, quick, satisfying, and very very fishy. 15 Responses to Obento with Tuna Fish for Two, Please! I donâ€™t know when the fish part droppedâ€”surely theyâ€™re still fish? But it seems that it outgrew the need to be labeled such. lol I wouldn’t actually say it “outgrew” the label so much as caught up with every other fish 😛 after all, it’s not like salmon was called “salmon fish” was it? Maybe when tuna became a steak, instead of a fish? Now, whenever someone mentions tuna, most people seem to think of a big slab, instead of a wonderful sandwich filling. It’s like bangus. No one calls it anything else. I think it’s a pinoy characteristic of dropping the noun since tuna stands for proper already. lol. I never had a habit of calling it tuna fish though. lol. maybe I should. Haha… di ko ata natawag na tuna fish yan! Kasi di ako mahilig sa fish nung bata ako. Following the same vein, what would happen to Starfishes and Jellyfishes? But we call Bangus Milkfish 😛 Hard to call it just milk, hwehwehwe. Still, I think calling it tuna instead of tuna fish seems to be the hip thing now, not only here in the Philippines. Even cookbooks and cooking shows just call it that. That’s cause you’ve a bottomless pit for a stomach. Fish and Fowl? Tsk tsk tsk, you probably just ate hotdogs and hamburgers. Well at least over here, I think maybe a few years back, they tried to make it… well, not really “politically” correct, but “more” correct… lol yeah something like that – being that starfish and jellyfish are invertebrates, they renamed them “sea-stars” and “sea-jellies” respectively. Didn’t quite catch on though. Ditto on the milkfish/bangus thing… because the “fish” part of milkfish (much like flying fish, clown fish, etc.) is part of the name itself, not just the classification. Sea jellies sounds like a candy treat 😛 You suddenly reminded me that I still have a pack of jellyfish in the cupboard. ^_^;; Nyums, good stuff. whenever i read or hear tuna, i remember ninja ian’s joke. I love love tuna sandwiches! My friend from gradeschool would always bring the perfect tuna sandwiches prepared by their house help and I haven’t tasted anything that tops it yet…I really should experiment on canned tuna more. It’s my favorite food. I eat it with rice, pasta, skyflakes, or on it’s own it’s still good…wheeeeeee~! And yay! You’re using my suggested onion technique! Hehe! Delifrance makes good Tuna sandwiches 😀 You may want to try it.